The Samsung Galaxy Note 7 is one of the first devices that come with the all new Gorilla Glass 5 which the company claims to be four times more durable than its predecessor and the current competition. According to recent lab tests, Corning Gorilla Glass 5 survives up to 80 percent of the time when dropped face-down from 1.6 meters onto rough surfaces, far outperforming competitive glass designs. 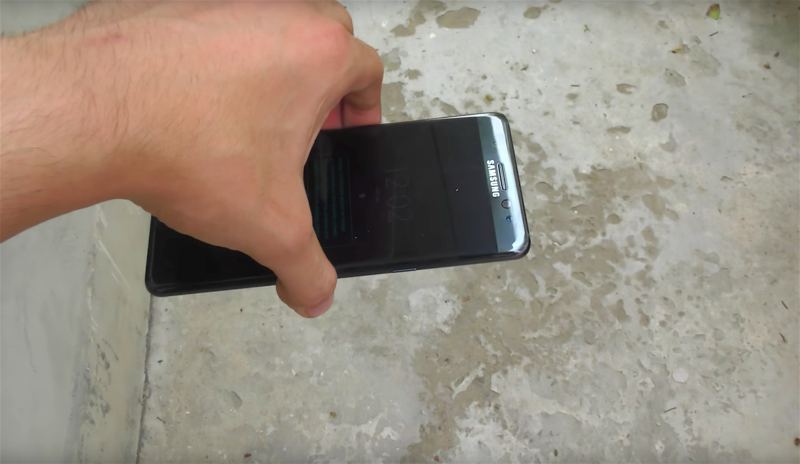 Well that claim has been put to test by our friends at XEETECHCARE who did a drop test with a brand new Galaxy Note 7. After conducting several drop tests from different heights, the front glass managed to survive every drop but much to our surprise, the glass at the back of the device got cracked in just the first drop which does raise a few eyebrows considering the fact Samsung have used the exact same glass on both sides. This proves that no matter how strong and durable the companies claim their phone display’s to be, at the end of the day one thing does stand out….Glass does Shatter!! For those of you who are planning to purchase this otherwise amazing device are advised to purchase a good quality back cover as well as a screen protector to save your device from any unfortunate mishaps as far as cracking or damaging your phone is concerned. The Galaxy Note 7 is set to arrive worldwide starting August 19th.